Who hasn’t wondered whether some of the things we read in sci-fi books will eventually become a reality? I for one definitely am thrilled with all the leaps and bounds in technology that have turned some of the fiction into fact and might someday turn even the seemingly impossible fiction into a reality. 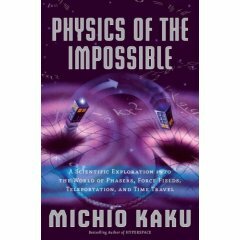 If you are one who enjoys not just mulling over these stuff but actually understanding the scientific basis behind seemingly impossible phenomena that you hope to become possible one day then you will find Michio Kaku’s book, Physics of the Impossible, really impossible to resist. telepathy and psychokinesis - would one day be more than pseudoscience thanks to advancements in superconductivity, nanotechnology, etc. The wonderful thing about this book is that it not only stretches your imagination but it also helps makes you realise the fact that there is so much more to be discovered, invented, and conceptualized. For those who are skeptical about the soundness of the book you would do well to know that the author, Michio Kaku, is the Henry Semat Professor of Theoretical Physics at the Graduate Center of the City University of New York and the co-founder of string field theory. He knows even more than what he is talking about. And in case you fear that it might all go over your head the good thing about the book is though a background in Physics is necessary to understand all the intricacies behind the concepts each “impossible technology” is actually discussed in such a way as to make it readable. He also draws parallels and refers to things that laymen will understand such as Star Trek, Men in Black, etc. making the book not only possible to read and understand but also highly entertaining.